The Boston Marathon is the oldest annual marathon in the world. The summer Olympics of 1896 were the inspiration for the first Boston Marathon which was organised by the Boston Athletic Association. That organisation has been responsible for the running of the marathon every year since it was inaugurated. The race attracts runners from all over the world. However they must be 18 years or older and meet certain qualifying standards. The first Boston Marathon was run in 1897 and attracted a field of 18 runners. On that occasion the winner was Irish-American athlete John J. McDermott. The event now attracts an average of around 30,000 registered participants every year. Millions of dollars are raised for many charities. In 1996 a record 36,748 people started the race. 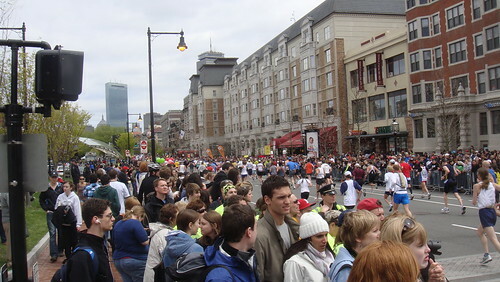 The race also attracts hundreds of thousands of spectators. The men’s record for the fastest Boston Marathon was set by Geoffrey Mutai of Kenya in 2011. The women’s record was set in 2014 by Rita Jeptoo also from Kenya. Neil Cusack from Limerick, Ireland won the Boston Marathon in 1974 in a time of 2:13:39. Though Roberta Gibb was the first woman to run the full Boston Marathon in 1966, women were not officially allowed to enter the race until 1972. That year eight women started the race and all eight successfully completed the course. For almost ninety years the winner of the race was awarded a wreath woven from olive branches. This changed in 1986 when the winner was awarded a cash prize. Tragedy struck the 2013 Boston Marathon when two bombs were exploded close to the finish line almost three hours after the winners had finished the race. Three spectators were killed and over 200 were injured. The race, which was held on April 15th that year, was halted and several people were unable to finish the course. The Boston Marathon was run for the first time in the year 1897 On This Day.